Hi!! I'm just trying to do a Legend of Zelda repro from a portuguese translated ROM by Hexagon I got from NesNinja site. For the ROM I used a P28f001, PRG RAM is a KMS6264A-12 and CHR RAM is a KM6264BL-10. So far so good the game only boots if I add R1, a 10k resistor, as show in the schematics, but when I press start it just locks out. If I leave it alone, it locks on the treasures screen. I just can't imagine what can be wrong. Anyone has any ideas of what can be happening? Are the schematics I followed correct? I've not put the battery on the board yet, but I think this could not be doing all this trouble. I'm not very familiar with what you are doing but depending on the size of the translation couldn't you just split the rom into 2 files and toss on two 27c801 and swap bin them and toss on a troy aikmen cart? Or is it too big a file for that? The original game is 1Mibit, as is the translation. It's not SNES, one doesn't need 8Mibit 'PROMs. The size is fine, it's just a 1mbit image. The memory you suggested AFAIK is a 8mbit. A lot bigger than needed. I'm just running out of ideas! Or there's some address lines incorrect? Only the ROM's A16 and the control lines of the RAMs, should I mod it someway? It's remotely plausible that the clone MMC1 emits WRAM/CE rather than WRAM+CE. But I really don't know, it seems at least as likely that the chip-on-board is some non-MMC1 thing and that the original was mapper hacked for the original Gol de Craque port. Yeah sorry I assumed this was snes. I should have read it a little better. Can you use a normal ntsc donor? If you can nes open golf and golf power should be good donors. You would just rewire the prg as follows. edit: that if for m27c eproms. Not sure about the eprom you use. Unfortunately I am not familiar with the boards and chips you are using so I will not be of much help. lidnariq, is there some way to confirm this? AFAIK this MMC1 clone has both CE and /CE. I don't know if it's functional. Before doing this repro, I tried Chip n' Dale on this board. I even had finished the game. icemanxp300: Yeah! I could be using official NES carts, it even seems easier to mod. But they are too expansive here, around 100 bucks each! Both Chip 'n Dale games are SLROM. For The Legend of Zelda, you want SNROM with battery. For Zelda II: The Adventure of Link, you want SKROM with battery. A MySQL configuration limit is preventing this post from appearing as intended. I will report it in phpBB issues. Maybe try making a reproduction of an SKROM board? to see if the supposed chip-on-board MMC1 matches up? 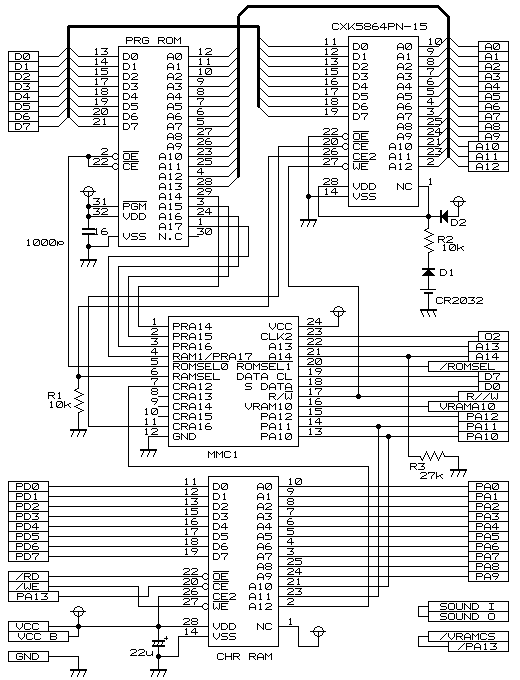 SNROM "should" have both /CE (pin 11, actually CHR A16) and +CE (pin 6) outputs. Will that work? Zelda uses onboard chr ram where as skrom has chr rom. It'll work if you skip The Legend of Zelda and instead make Zelda II: The Adventure of Link. Right, I just meant "test with another game"
Cut the trace to the old A16 on the 28 pin chip (22), bridged the trace to the 32 pin's chip pin 2. Bridged the 32 pin IC pín 24 to pin 22. Made 4 holes on the board, so I don't need to bend the IC pins. Cut the pin 22 trace and bridged to /RD. Bridged pin 20 to PA13. Cut pin 27 trace (was going to MMC1 pin 9) and bridged to PPU /WE. Disconnected pin 26 from MMC1 pin 8 and bridged to VCC. Bridged pin 1 and 28. Cut the trace on pin 22 and bridged to GND. Cut the trace on pin 26 from MMC1 pin 22 and bridged to MMC1 pin 6. Cut the trace on pin 27 from MMC1 pin 1 and bridged to MMC1 pin 17. Cut the trace on pin 20 and bridged to MMC1 pin 11. Cut the VCC trace and added a diode to it. As far as I remember, I have not done anything else besides adding R1 and R3. The traces I have cutted that were going to the PRG ROM where later rebridged to the ROM, leaving some more traces that goes to PRG RAM alone. Should change the PRG RAM (or WRAM) to the CHR RAM's same IC model be a good idea too? At first it was the same, than I removed R1 and R2. The game stopped locking on presentation, has some graphical glitches, but works. Then, at the name entry there are 3 names wich I can't select. I erased them all and tried to create a new one, but as soon as I finish the names appear again with weird chatacters and I can't start the game. Is this game timing critical? Why such difference with a slight faster RAM? After my vacations, I'll try to resume this project. I'll try Metroid in this board this evening. I would be glad if someone could give me something to at least start debugging it.